2017 Horoscope predictions for people born in the Monkey year warn them to be careful in the year 2017, as you might face hardships, bad luck and inauspicious outcomes. Good luck will come easily to people of this animal sign this year if you make the right choices. You are advised to avoid indulging in gossip or negative thoughts. Most of the people born in the Monkey animal sign of the Chinese lunar calendar end up as inventors, scientists, entertainers or artists and they are always more creative in the later stages of their life. They are aware of their surroundings and are always in charge of things around them. They can be secretive when needed. 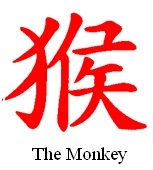 The Monkey Chinese astrology sign is considered to be the most flexible signs of the Chinese zodiac. They are known for not beginning tasks if they cannot complete it immediately. They also have a good memory and are always on a quest for deeper knowledge. Year of Monkey celebrities are David Copperfield and Harry Houdini. Career predictions for the Monkey forecasts, that 2017 might be a difficult year for new ventures in business. You might need to work harder than normal to achieve even a little bit of success on the job front. Good fortune may not side with you this year but that does not mean that you do not continue making investments or savings. Avoid giving loans of any kind to friends and family. You need to have total faith and patience in your relationships. Love breakups and extramarital affairs may happen if you are not careful. Wellness predictions for the Monkey sign in 2017 are average. Do not ignore even the slightest of symptoms. Improve your health with good healthy food and regular physical activity. Monkey people might face hostile conditions and even violence at times in 2017. If they listen to their mind in these situations, they can easily escape from it. But their strength can be weakened by engaging in unwanted thoughts, which needs to be avoided.